The Atmos Ruva is a pocket-friendly dry blend vaporizer from AtmosRX that offers the utmost of convenience for vaping while on the go. 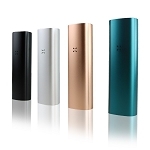 This discreet portable vaporizer from AtmosRX comes equipped with a deep pure glass quartz heating chamber that evenly vaporizes dry material, delivering a thick amount of vapor that is absolutely packed with flavor. This glass quartz chamber can be controlled using the regulatory buttons found on the side of the device. Use these controls to adjust the Ruva's max temp setting to range anywhere from 330ï¾°F-430ï¾°F, allowing you to find the optimal temperature for whatever type of material you are vaping. Once your desired temperature has been achieved the Ruva will make sure you know using the innovative vibrations notifications, perfect for discreet vaping on the go. The Ruva Vaporizer from AtmosRX is powered by an embedded 1800mAh lithium-ion battery that features a convenient micro-usb charging method. 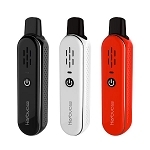 The 1800mAh capacity offers an impressive life span for a dry blend vaporizer that will delivery several cycles before eventually needing a recharge, once that time comes the USB charging method ensures you are always able to charge no matter where you may go. 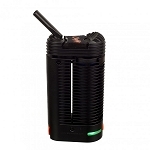 AtmosRX's Ruva vaporizer also features a large OLED screen that neatly displays all pertinent information on one screen. An innovative easy-access mouthpiece allows you to quickly refill the Ruva's heating chamber in just a matter of moments using the included stainless hand tool. Once refilled simply replace the mouthpiece and the set of four strong magnets will ensure the Ruva vaporizer remains closed at all times until you deem otherwise.